We suggest to check these rooms that are available in your country or visit this full list. Full suite of products including sports betting, Fantasy Sports and casino. Most multi-table tournaments have buy-ins of €5 or less. 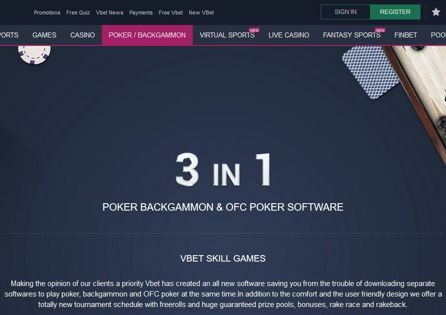 One of the unique features of Vbet Poker is that its software allows you to play poker, Open Face Chinese Poker and backgammon at the same time. Vbet Poker, regulated by the Malta Gaming Authority, has a user-friendly design, and offers an extensive tournament schedule along with awarding its players up to 50% rakeback every week. Vbet Poker has the potential to be a major player in the online poker world thanks in part to it being completely focussed on its customers' needs. Offering poker and backgammon (Open Face Chinese Poker is coming soon) from the same software means you can play all of your favorite games from a single software download and allows you to switch between games, and even play them at the same time, with ease. Poker games aside, Vbet has a wide range of products for its customers to enjoy. Head to the Vbet wesbite and you'll find Vbet Poker backgammon, a vibrant sportsbook, Fantasy Sports, a state-of-the-art online casino, virtual sports and more. Vbet Poker really is your one stop shop for all matters gambling and gaming. Instead of offering a traditional welcome bonus, Vbet Poker operates a rakeback scheme that sees you earn up to 50% of the rake you have paid over the past seven days; the more you play, the more you receive back in your account. The best thing about this rakeback offer is you do not need Vbet Poker bonus codes, just deposit at least €10 and then generate some rake to be rewarded with weekly rakeback. If you're looking for a way to give your poker bankroll a boost for free then you need to check out the daily Vbet Poker Freerolls. Some of the freerolls allow players to make rebuys and add-ons, but you do not need to take this option and can try to play your way towards the money places for free. As you would expect from a modern online poker site, Vbet Poker spreads a variety of real money cash games and tournaments. Download the Vbet Poker software and you'll find fixed limit, pot limit and no limit hold'em games, and pot-limit Omaha with heads-up, four-max, six-max and nine-handed tables available. Stakes for Vbet Poker cash games start at €0.02-€0.05 and increase to €2-€4. Vbet Poker's tournament offerings are also available in fixed limit, pot limit and no-limit hold'em, and pot-limit Omaha with buy ins starting as low as €0.10 ad increasing up to €25, although larger buy ins are available during festivals. Tournaments are offered in freezeout, re-entry and knockout formats, giving you plenty of choice when it comes to choosing a Vbet Poker tournament to play in. Vbet Poker Open Face Chinese Poker is currently in development and will become available to play soon. Vbet Poker OFC cash games and tournaments are expected to be available on the download client at launch with plans to make them available to the Vbet Poker mobile client soon after. Vbet Poker isn't currently available on mobile at present, but the developers are looking at making a Vbet Poker Android and Vbet Poker iOS app to allow its valued customers to play poker on the move. Should you encounter any issues while playing at Vbet Poker, you will find a FAQ guide via the help link within the Vbet Poker software. If you would rather interact with a human rather than reading the FAQ guide, live chat is available throughout the day and the representatives are very quick to respond to your queries.